I'm in the U.S. I keep coral species within enough space from each other that I don't see them damaging each other. I had a torch in the past that would sting mushrooms once in a while. distilled water doesn't have TDS? Nope. I had a nice spread all over the tank. The AI Prime HD covers 24"x24 "I believe which is enough spread to cover the EVO. I had the same tank and ran an AI Prime HD on it and it was amazing. Simple to set up and gives you a lot of control through the phone app (or computer). Cut down on the feeding and get on a regular schedule for it. 1x every other day (dry), and 1x/week frozen etc. Cut the light schedule down as well (this helped in my case). My fusion journal: IM Fusion 20 The EVO was a very nice tank. I just got tired of the limited space. 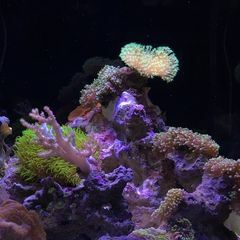 Corals grow fast. My GSP took over the entire rockwork. I also did not like doing weekly water changes. 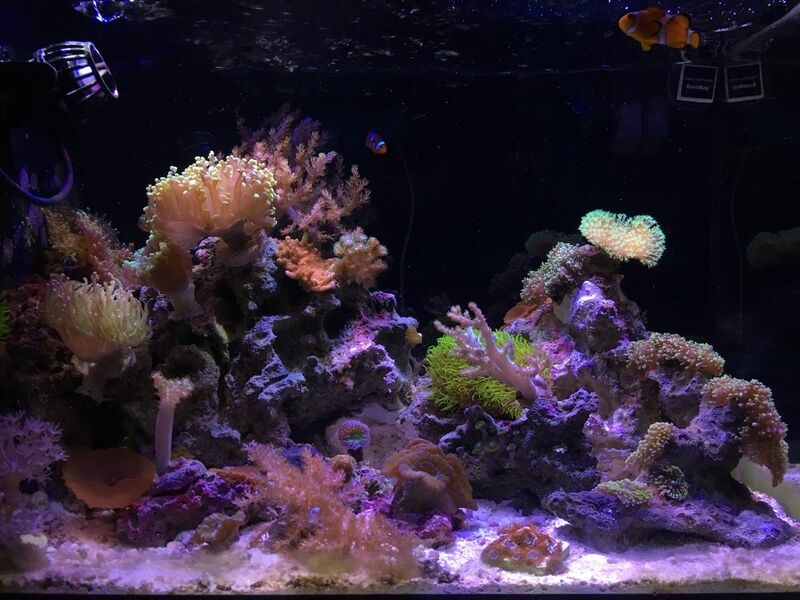 I saw a ton of growth in corals when I upgraded to an AI Prime HD. I had this same tank for about 1 year 7 months. 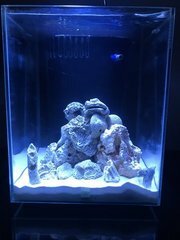 I now have a 20 gallon IM Fusion. I feed Hikari and New Life Spectrum pellets. Also feed Reef Chili and Reef Roids (maybe 1x week or 1x every two weeks). Also feed frozen pe mysis once in a while. I used to do 3 gallon water changes on my EVO every Sunday (sometimes 5 gallons to remove nutrients from overfeeding). I would get some test kits to make sure your Alk is consistent. yup. they look very similar. I have not seen sweeper tentacles coming out of it so it makes me doubt it’s a Galaxea. When dosing, do I shoot to match the Alk/Ca of my tank water or salt mix? I have a 20 gallon. Salt mix Alk was 13 but my tank water was 8.3-8.5 somewhere in that range. Before water change my Alk was around 7 (possibly 6.7). It's a small frag. I think it's a Galaxea but I have no seen any tentacles. Thanks. It's a pain in the A**. I was warned about letting GSP get out of control. That piece of rock is my entire rockscape from the previous tank and GSP took it over in about 1 year I believe.